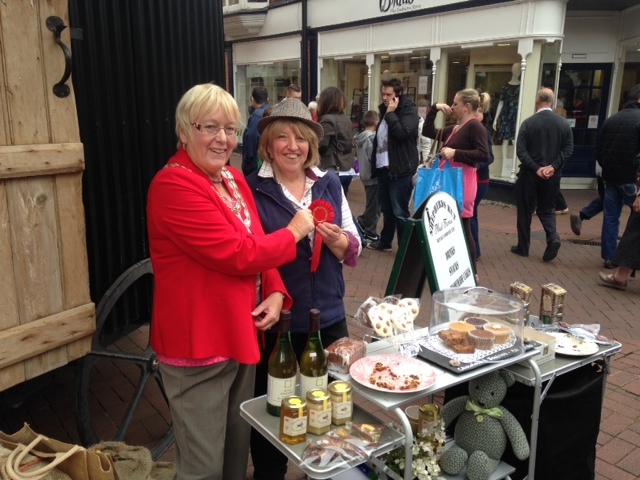 Taking place in the streets of Nantwich and around the towns grand Church, the annual food and drink festival was the first we have attended which took place in a town. Logistically, manoeuvring the hut through the streets of Nantwich was going to be a challenge. Firstly, we had to drive the Hut from Loggerheads to Nantwich; this would be the furthest distance the Hut had travelled. Around halfway through the journey unaware of the mile long queue we had created due to our, let’s say ‘constricted’ top speed, we pulled over to let cars pass. I hid my face in my hands after what seemed like an endless run of cars passed us, full of relieved drivers. We finally arrived in Nantwich after an hour and a half drive, and the Hut had made it intact! Our next mission was to find the ‘red’ exhibitors area. A simple instruction, just follow the signs provided. After ten minutes of looking for the right entrance we had driven completely through the town and had come out the other end. The sign couldn’t be seen anywhere, and after a few more laps of Nantwich I jumped out of the car to ask someone local for directions. After finally positioning the hut in the centre of Nantwich, and nearly running over a few daft pedestrians, we were safe to breathe a sigh of relief. To our delight the hut looked fantastic amongst the historic backdrop of the Roman buildings and gathered immediate attention as we started setting up. We spent the whole weekend at Nantwich amongst an array of delicious food and drink traders. We were even formally announced (or shouted about) by our friend, the town crier, who afterwards very kindly started sharing his throat clearing sweets with me. However, after selling out of bara brith, winning an award for the most individual stand, and being interviewed by BBC radio Stoke amongst a rush of teas and coffee, we were finally on our way back to our beautiful and familiar spot on Moel Famau. Nantwich was a pleasure, even though it was a bit of a maze, and we will be sure to return next year to share a little taste of Wales once again.